The shopping centre ‘Wolf’ will contain retail for an area of 60,000 sqm of Gross Leasable Area (GLA) and will be situated in the southern periphery of Rome along one of the arteries that links the centre of Rome to its southbound hinterland. The aim of this study is to confirm the potential of the site in terms of its geographic location and hence the potential user population within a catchment area of 30-minutes-drive by car. Systematica carried out a detailed territorial analysis utilizing partially its database and referring to similar cases of projects done in the past. This was aimed at offering a comprehensive study of the catchment area that the new development will have and thus assist the client in taking commercial decisions and related evaluations. All updated data regarding demographic characteristics, population, density, etc., were purchased from national census bureau (mainly ISTAT) to guarantee accurate and updated outcomes. 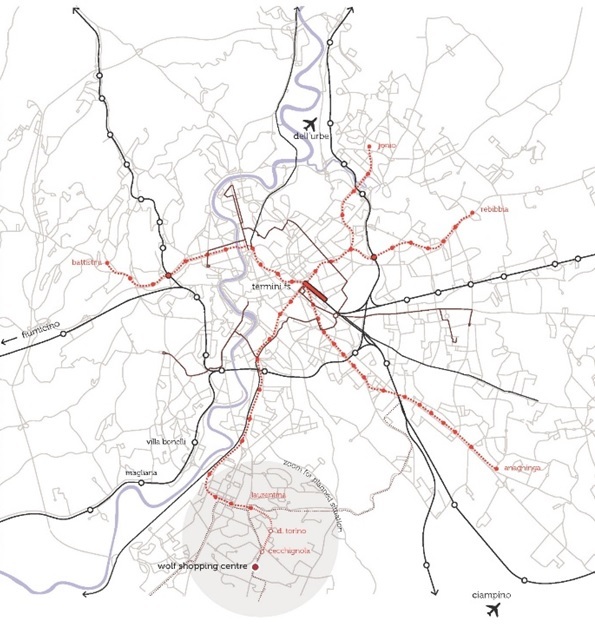 The study concerns public transport, highlighting the bus lines that cover the project area, including their point of origin and destination.